Every week, I look at the list of weekly dividend increases, in order to uncover hidden opportunities. I also use it in order to review the dividend performance of the companies in my portfolio. In this article, I am going to highlight a couple companies, which raised dividends. I weeded out companies that has low current yields or had low streaks of dividend increases. I looked at the initial statistics such as earnings and dividend growth over the past decade, and I found them promising enough to put in focus, and place on my list for further research. Lockheed Martin Corporation (LMT), a security and aerospace company, engages in the research, design, development, manufacture, integration, and sustainment of advanced technology systems and products for defense, civil, and commercial applications in the United States and internationally. The company raised its quarterly dividend by 15.60% to $1.33/share. This marked the eleventh consecutive annual dividend increase for this dividend achiever. Over the past decade, Lockheed Martin has managed to increase dividends at a rate of 24.70%/year. The company is projected to earn $9.46/share in 2013 and $9.64 by 2014. Currently, Lockheed Martin trades at 13.60 times forward earnings and yields 4.10%. Values like this are hard to come by in the current environment. I analyzed the company back in 2010, and liked everything except for the fact it hadn’t raised distributions for ten years in a row. I plan on reviewing the company in more detail in a future post, and make a decision on whether I should buy it or not. Accenture plc (ACN) provides management consulting, technology, and business process outsourcing services worldwide. The company raised its semi-annual dividend by 15% to 93 cents/share. This marked the ninth consecutive annual dividend increase for Accenture. 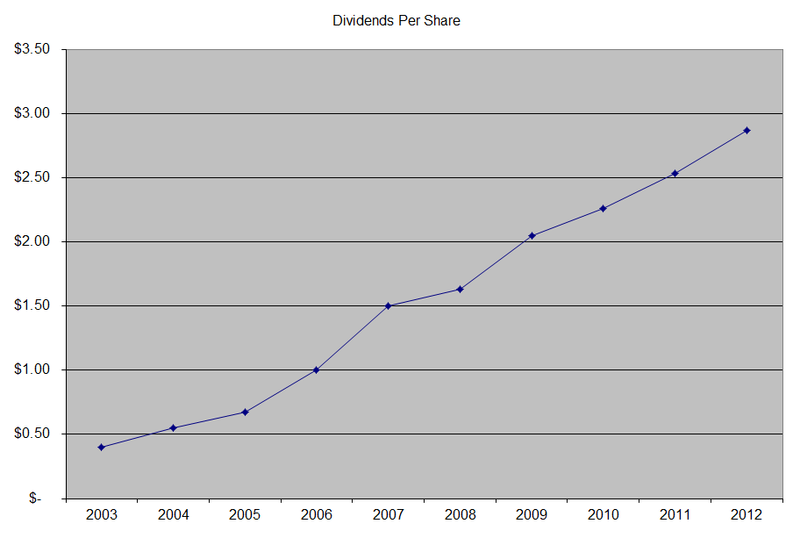 Over the past five years, Accenture has managed to increase dividends at a rate of 28.70%/year. The company is projected to earn $4.47/share in 2014 and $4.94 by 2014. Currently, Accenture trades at 16.60 times forward earnings and yields 2.50%. I like how the company has managed to grow earnings and dividends over the past decade, and I also like the strong brand name that company has. I am going to place these quality companies on top of my list for further research. I like the fact that I still can find value even in an overextended market like todays. Ten Dividend Paying Stocks I purchased in September. I usually try to analyze one dividend paying company every week. In a typical stock analysis report, I would outline the years of consecutive dividend increases along with the amount and timing of the latest dividend increase. I would then look at trends in stock prices, earnings per share, dividends, dividend payout ratios and returns on equity over the preceding decade. Right under earnings per share, I typically try to discuss qualitative factors that might drive future profitability. Basically in the article I discuss how I like a record of dividend growth, earnings growth and a sustainable dividend payout ratio. If the stock has these traits, I then focus on valuation. In my conclusion section, I usually link to my article on entry criteria when I call a stock attractively, fully or overvalued. In my article on entry criteria I discuss that I am not willing to pay more than 20 times earnings for a stock and require at least a 2.50% in minimum yield. If the company trades at less than 20 times earnings, and yields more than 2.50%, I would call it attractively valued and call it a day. However, if the stock trades above 20 times earnings or yields below 2.50%, I would try to calculate a reasonable price which would make it a good buy on dips. This entry criteria applies to most corporations that pay dividends and are traded on exchanges. For example, Automated Data Processing (ADP) trades at 25.80 times earnings, which is above the price I am willing to pay for it. If it earns $2.89/share, at 20 times earnings, the most I would pay is $58/share. Hence, if I posted an analysis on ADP I would say it is overvalued at 25 times earnings, and would buy on dips below $59. If Automated Data Processing (ADP) traded at $50/share, and earned $3/share, I would say it is attractively valued at the moment. For example, in my analysis of Wal-Mart Stores (WMT), I discussed that I thought the stock was attractively valued at the moment. Hence, I recently bought some for my 2013 Roth IRA. Instead I use the P/E and yield as mentioned above. However, I do select companies that have raised dividends for at least a decade, and which usually have done so above the rate of inflation. In the end, yield and dividend growth is a balancing act. I select companies that have not only raised dividends by say over 5-6%, but I believe also have a decent shot of continuing that in the foreseeable future. I expect dividends to grow over time, I just don’t want to overcomplicate things by assigning forecasted values and proving my point mathematically. I would avoid doing math since I can mention my expectations with one single sentence or less, and have them already built into the assumption. The only thing that is constant in life is change. The world of dividend investing closely follows this eternal truth as well. For example, in the past two decades investors have witnessed several implosions in large companies that have previously been considered blue chip stocks. Companies such as AT&T Corp had mostly lost its status as a widows and orphans stock after the split in 1984, cut dividends in 2001, and was eventually purchased by SBC Communication in 2005. SBC Communications took the AT&T name after that. Another example includes financial institutions such as Bank of America (BAC), Citigroup (C ), Wachovia and US Bancorp (USB) which were regarded as safe blue-chips by investors for many years. These companies managed to boost distributions for several decades, and could be found on the dividend aristocrats lists. In fact, these companies exemplified the characteristics of the perfect dividend growth stocks, since they not only provided high yields but also grew distributions at above average rates. While the financial crisis of 2007 -2009 proved that this was all based on financial alchemy, investors who sold after dividend cuts and reinvested proceeds in other income producing securities did fairly well. Even stodgy utilities, which investors regard as safe investments could deliver their fair share of losses. For example, in 1974 Con Edison (ED) skipped dividends for one quarter and then initiated them back at a rate that was 55% lower than prior to the cut. This was prompted by the fact that the company used oil for its power generation facilities, and the oil embargo made it unable to pass price increases to consumers quickly enough. In addition, it was burdened by construction projects used to increase capacity, all of which caused a shortage of cash. This probably surprised many investors, who were relying on dividends of otherwise stable utilities. In fact, when I look at records of utilities companies in the Dow Jones Utilities Index, there are just a few that have never cut dividends. This goes on to show, that time and again, dividend investors might fall in love with a certain sector, be it master limited partnerships, financials, consumer staples or real estate investment trusts. If they are not careful however, and overexpose themselves to certain sectors, they increase the riskiness of their portfolios. In essence, there are no perfectly safe investments. While a company looks perfectly stable today, and poised to grow forever, the reasons why it would implode might not be known for several decades. As a result, buy and hold dividend investors should regularly monitor the companies they own and devise a plan to sell if a certain trigger event occurs. For example, I would automatically sell a stock after it cuts distributions. I would then reinvest capital in a company in a similar industry. My experience has uncovered that companies that admit they no longer can afford to pay distributions are very risky. Essentially these stocks either go to zero after cutting dividends, or deliver stratospheric returns after that, with equal chances of either outcome. However, by retaining flexibility to sell after a cut, an investor saves their portfolio for another day. By reinvesting into another company, the investor also recoups a portion of the lost income. If the dividend cutter eventually starts raising distributions again, you can always get back in. As a dividend investor, I would expect that names in my portfolio in 2042 would likely be different than the names present in 2012. After all, since 2008 I have experienced several cuts in my income portfolio. I had one cut in 2008 (ACAS), two cuts in 2009 (GE, STT), one cut in 2010 (BP) and no cuts in 2011 and 2012. 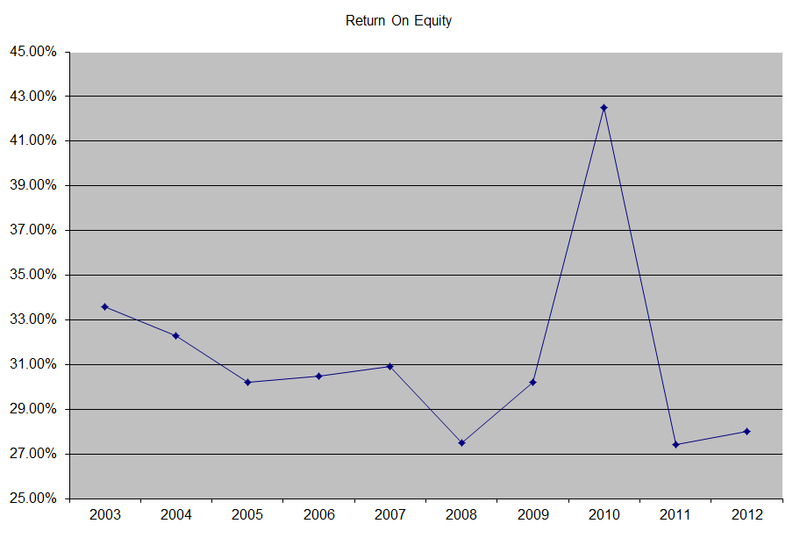 With three months to go in 2013, I have not experienced any dividend cuts either. By maintaining a relatively diversified portfolio consisting of over 40 individual issues, my total dividend income is somewhat immune by dividend cuts or eliminations. If two companies in an equally weighted portfolio of 40 issues completely eliminate dividends but the remaining 38 issues raise distributions by 5%, my dividend income would be unchanged for the year. Assuming that I manage to replace the fallen dividends stocks I sold with fresh income stocks, I might even be able to eke out a gain in total dividend income. Monitoring 40 – 50 positions should not take a lot of time as well. Assuming that investors have done their homework in the initial stage, future time could be allocated reading annual reports and maybe quarterly reports while also performing an annual checkup of their position. I would not expect this to take more than 10 -15 hours/week. After all, a company like McDonald’s (MCD) would keep being in the restaurant business for as long as possible. Its business model of delivering a consistent customer experience on a global scale should not change much. Its expansion might come not just by opening new stores internationally however, but by renovating existing locations, innovations in its menu and attracting new customers from a young age. These megatrends do not happen overnight, and would likely take years to develop. Another example includes Wal-Mart (WMT), which is the world’s largest retailer. While the company has largely saturated US market, it could grow substantially abroad. In addition, it could also grow organically by making stores more appealing to consumers. At the same time, if investors use the company’s product or service in their everyday lives, they might gain an insider’s look at things, even before the annual reports are out. McDonald’s Corporation (MCD) franchises and operates McDonald's restaurants in the United States, Europe, the Asia/Pacific, the Middle East, Africa, Canada, and Latin America. The company raised dividends by 5.20% to 81 cents/share. This was the lowest rate of increase since 2002, when dividends were raised by only 4.40%. The five year dividend growth rate is 13.90%/year. However, variability in dividend growth rates are something normal and to be expected in a long-term dividend holding. This dividend champion has raised distributions for 37 years in a row. The stock is attractively valued at 17.80 times earnings and yields 3.30%. I recently added to my position in the stock, and would buy more subject to availability of cash. Check my analysis of McDonald’s. Realty Income Corporation (O) is a publicly traded real estate investment trust. The company raised monthly dividends to 18.185 cents/share. This dividend achiever has raised distributions for 19 years in a row. The five year dividend growth rate is low at 1.50%/year. However, this period includes the Financial Crisis, which led to steep dividend cuts across the REIT sector. The REIT yields 5.50%. I recently added to my position in Realty Income, with a purchase on Friday. Check my analysis of Realty Income. Microsoft Corporation (MSFT) develops, licenses, and supports software, services, and hardware devices worldwide. The company raised dividends by 21.70% to 28 cents/share. This dividend achiever has raised distributions for 11 years in a row. The five year dividend growth rate is 15.10%/year. While the stock is attractively valued at 12.70 times earnings and yields 3.40%, I am not able to determine if 20 years from now it would have the same durable competitive advantages in has today. Check my analysis of Microsoft. YUM! Brands, Inc. (YUM), together with its subsidiaries, operates quick service restaurants in the United States and internationally. The company raised dividends by 10.40% to 37 cents/share. This dividend achiever has raised distributions for ten years in a row. The five year dividend growth rate is 17.80%/year. The stock is valued at 23 times earnings and yields 2.10%. The company has had some short-term headwinds in China, which would likely create opportunities to accumulate the stock on weakness. I do not believe these short-term issues will affect the long-term growth potential of Yum Brands. I would look forward to adding to my position in Yum! Brands on dips below $60/share. Check my analysis of YUM! Brands. W. P. Carey Inc. (WPC) is an independent equity real estate investment trust. The company raised its quarterly dividends to 86 cents/share. This dividend achiever has raised distributions for 16 years in a row. This REIT yields 5.20%. 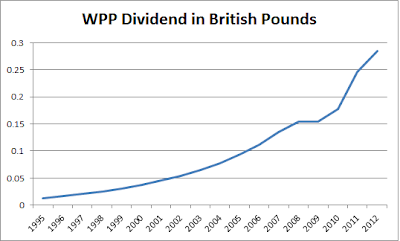 I had been following dividend increases in W.P. 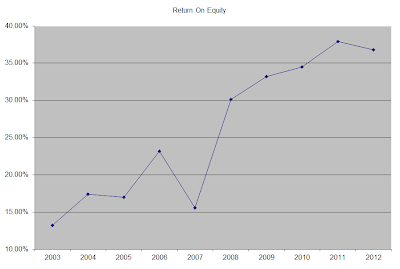 Carey for several years, and was aware of the potential for strong dividend growth after 2012. For whatever reason however, I failed to pull the trigger. Sometimes, failing to act timely on companies to buy can result in missed opportunities, which are not reflected on your brokerage statements or tax returns. One of my favorite shows is Mad Men. The story depicts life in an advertising agency in Manhattan in the 1960's. I was intrigued by the portrayal of the advertising business, since it involved maintaining client relationships for long periods of time if successful. I also wanted to look for ideas beyond the usual investment targets. Advertising agencies have a very interesting business model. Businesses have to advertise their products or services, even during a recession. The business of advertising agencies is not characterized by heavy capital investment, typical to most other professional service organizations. However, because few of the companies have raised dividends for at least ten years in a row, they are not found on typical dividend growth screens. The business is characterized by having strong relationships with clients, who trust their agencies with everything related to the advertising process. This includes the creative process of making the actual ad across different channels such as print, TV or web, to purchasing ad space across multiple platforms. Once a client is working with a particular agency, chances are that the relationship can last for many years. After all, by working with clients for many years, advertising agencies know their business, their executives, and the needs of the business better than what a newcomer would do. As a result, big accounts stay with their agencies for many years, which could translate into a steady stream of profits for those agencies. Advertising companies also have the scale to implement the ads using a variety of channels within their control, either print, TV, radio, web or other channels. As new channels to reach the consumer like web and mobile are developed, there is an even higher opportunity for advertising companies to offer more services. The repetitive nature of advertising virtually guarantees revenues and profits for ad companies even during a recession. Some pundits claim that the business of advertising agencies is threatened by online and mobile advertising. However, digital is not a threat but rather an opportunity, because it merely represents another channel through which to reach out to consumers. A company like Coca-Cola cannot advertise solely online. Thus, companies need someone like WPP Group or Omnicom to execute a marketing strategy consistently across different channels. The business also has some float as well, which is created by the timing of payments from client to advertising agency and from advertising agency to media publisher. Because of their scale, advertising companies can negotiate much cheaper rates with media companies than those which the clients pay. Many share a portion of the savings back with the client, which creates a mutually profitable arrangement. Revenue for creating ads is usually billed by the hour, plus a profit and overhead. In addition, most contracts allow for an incentive to be paid out to advertising companies if specific qualitative or quantitative results are hit. Advertising agencies essentially have a toll-bridge type business model, that connects customers with TV, print, radio and online companies. The market is dominated by a few large players such as Omnicom, Publicis, WPP, Interpublic. Unfortunately, none of them has a history of regularly raising dividends. WPP plc (WPPGY) provides communications services worldwide. The company seems to have frozen its dividend in 2009, which ended its streak of consecutive dividend increases. 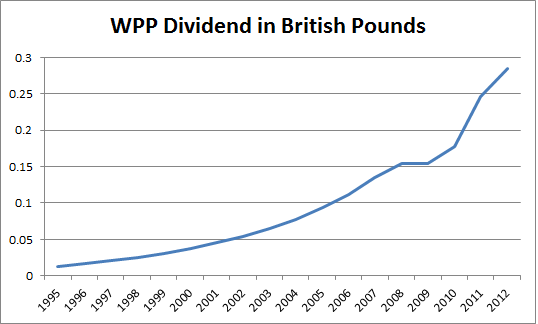 WPP was dropped from the list of international dividend achievers after the dividend freeze of 2009, although it would likely be added back in 2014 if it maintains a five year streak of dividend increases. I reviewed the company site, and could find raises starting in 1995. This is the advertising company I would likely consider for inclusion in my dividend portfolio if it trades at attractive valuations. Currently, the stock is slightly overvalued at 20.90 times earnings and yields approximately 2.30%. I would need to research the company in more detail and analyze it, before I initiate a position in it, but I usually require at least a 2.50% entry yield coupled with a P/E ratio below 20. The company might not end up delivering dividend growth every year, but over time, I expect it to grow dividends above the rate of inflation. Omnicom Group Inc. (OMC), together with its subsidiaries, provides advertising, marketing, and corporate communications services in the Americas, Europe, the Middle East, Africa, and the Asia pacific. While the company has not raised dividends every year, over the past decade it has managed to quadruple the quarterly payment from 10 to 40 cents/share. When I initially started researching the basics of the advertising companies, I found Omnicom to be a company I would consider owning one day. Unfortunately, with the announced merger with french company Publicis (PUBGY), there are some changes to take into account. It looks as if the new company will be based in the Netherlands, which could pose issues for dividend investors from a tax withholding standpoint. In addition, companies that merge might lose focus on their brands, as Interpublic did in late 1990's. I also do not like the fact that the combined Omnicom/Publicis will have both Coca-Cola and PepsiCo as clients. I am not sure if these clients would be happy if their business is handled by the same advertising agency. Currently, Omnicom trades at 17.70 times earnings and yields 2.50%. The third advertising company I reviewed was Interpublic (IPG), which provides marketing and advertising solutions worldwide. While it does not have a consistent history of raising dividends, the company could well be an acquisition target itself. The company went on a major acquisition spree in the late 1990's, lost focus, and eventually cut dividends in the early 2000's. It reinstated it a few years ago, and currently trades at 18.90 times earnings and yields 1.80%. Warren Buffett used to be a shareholder in Interpublic between the bear market in 1972 - 1974 and the mid 1980's. Earlier this year, I decided to max out any tax-deferred accounts I am eligible for. This included 401 (k), Sep IRA and ROTH IRA. My goal is to not only have a diversified income portfolio, but to diversify from a tax perspective as well. At the beginning of September, I tweeted about purchasing shares in ten attractively valued companies in my Roth IRA. The Roth IRA has several very appealing features such as tax-free compounding of capital, distributions are never taxed and there are no required minimum contributions. I allocated $2,000 to the purchase of ten securities in September, and have $3,500 more to invest until the contribution limit of $5,500 for 2013 is exhausted. The brokerage used to execute this transaction was Sharebuilder. I believe that this is the best brokerage to use if you are just starting out your dividend investing journey and have low initial amounts of capital to invest. It is important to maintain low costs when purchasing dividend paying stocks. As a rule, I try to avoid paying more than 0.50% in commissions on my purchases. With my regular accounts, it is easy to achieve that if I pay less than $5/trade and invest at least $1,000 at a time. With Roth IRA’s however, the $5,500 limit makes it difficult to invest in more than 5 – 6 companies/year at such commission rates. Since I have much more ideas than that, and since I wanted to have a diversified allocation each year, I decided to buy a greater number of companies. I signed up for Sharebuilder’s automatic investment program, which charges $12/month for 12 automatic monthly stock purchases. These stock purchases are executed on Tuesdays, with the automatic investment program. I also wanted to build the allocation over a period of time, rather than in a lump sum. I am allocating $2,000 in September, $2,000 in October and $1,500 in November. Since the first month of signing up was free, I am essentially going to end up spending $24 to invest $5,500, which is only 0.43%. After that I am going to cancel the service, until I am ready to put the contributions for year 2014 to work. The goal of every dividend investor should be generating a dependable income stream which grows over time. Dividend investors should not sacrifice the relative safety of their principal. While stock prices fluctuate and stocks do not have a guaranteed maturity price like bonds, investors should not lose track of security of principal in their quest for yield. Investors are automatically sacrificing the income and principal of their investments by chasing yield, overpaying for the equities they purchase and failing to properly understand the business and its prospects they buy into. The Dean of Wallstreet, Ben Graham, came up with the following definition of what an investment should achieve: "An investment operation is one which, upon thorough analysis, promises safety of principal and an adequate return. Operations not meeting these requirements are speculative." Dividend investors should thoroughly analyze the companies they invest in, to make sure their financial foundation is sound. A sound foundation such as a plan for growth, can result in increase in earnings and dividends over time. In addition, it is imperative that dividend investors also evaluate valuation of the company whose stock they are purchasing. Even the best dividend paying companies such as Coca-Cola (KO) are not worth purchasing at any price. Investors, who purchased the stock at the highs in 1998, are still sitting at unrealized losses, and the only return they have generated has been from the rising dividend. Investors should also avoid chasing yield without understanding the reasons behind it. For example, there has been a lot of interest about mortgage REITs such as American Capital Agency (AGNC) and Annaly Mortgage (NLY). Retirees are easily attracted to the mouthwatering yields on these investments. However after observing and discussing investors who own these securities, I have come to the conclusion that many are new to dividend investing in general, they do not understand the risks behind these companies. It is also evident that many probably have not spent the time to understand how these REITs generate these distributions. These observations are not scientific in their nature of course, and I hope I am wrong on them. The reason why I am unsure about these investments is because their distributions fluctuate greatly, as they are affected by the difference between short term borrowing close to the Fed Funds rates and subsequent investment in mortgage backed securities issued by Fannie Mae or Freddie Mac. Forecasting long-term interest rates is an exercise in futility, and so is the exercise of forecasting the spreads between interest rates on mortgage backed securities and federal funds rates. At the same time, investors who focused on traditional dividend growth stocks saw increases in dividend incomes, albeit they received much smaller initial distributions. However, most dividend growth stocks have stable and growing distributions, which do not fluctuate and make living off dividends much easier. In comparison Realty Income (O) traded at $25.29/share at the end of 2004 and paid monthly dividends of 10.90 cents/share, thus yielding 5.20%. 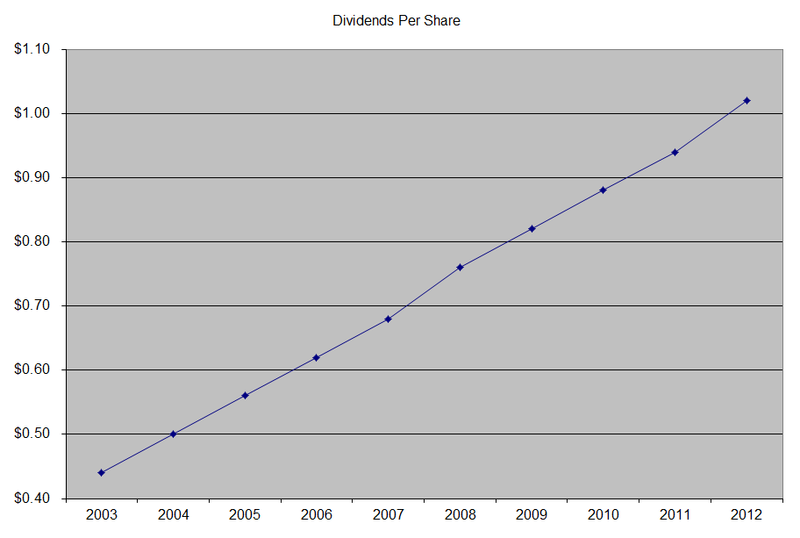 The monthly dividend was never cut, and it increased to 11.60 cents/share by 2005 and 12.60 cents/share by 2006. The main difference is that the revenues for Realty Income are coming from recurring rent checks from its hundreds of properties, whereas the distributions from mREITs come from fluctuating spread between short term borrowing and the rates on mortgage backed securities. A Quest for Income at Retirement – Can you Make it Alive? The Coca-Cola Company (KO) manufactures, distributes, and markets nonalcoholic beverages worldwide. This dividend king has paid uninterrupted dividends on its common stock since 1893 and increased payments to common shareholders every for 51 consecutive years. Warren Buffett’s Berkshire Hathaway (BRK.B) is the largest shareholder of the world’s largest beverage company. The company’s last dividend increase was in February 2013 when the Board of Directors approved an 9.80% increase to 28 cents/share. Coca-Cola’s largest competitors include PepsiCo (PEP), Dr. Pepper Snapple (DPS) and Monster Beverage (MNST). Over the past decade this dividend growth stock has delivered an annualized total return of 8.60% to its shareholders. The company has managed to deliver a 9.20% annual increase in EPS since 2003. Analysts expect Coca-Cola to earn $2.11 per share in 2013 and $2.28 per share in 2014. In comparison Coca-Cola earned $1.97 /share in 2012. The company has managed to reduce the number of outstanding shares from 4.916 billion in 2003 to 4.527 billion in 2013. The spike in 2010 EPS was caused by a onetime accounting event related to recognize a gain on the 33% stake in Coca-Cola Enterprises that Coke already owned before acquiring the bottling giant. Coca-Cola's 2020 Vision Strategy strives for a high single digit annual EPS growth throughout this decade, driven through 5%-6% annual increases in revenues as the company expects 3%-4% yearly increase in sales volumes. Some of the company’s acquisitions over the past years have provided increased exposure to higher growth still beverages, which is where Coke lags behind PepsiCo (PEP). The acquisition of CCE’s North American bottling business should bring in sufficient cost savings for the company’s North American supply chain, which would result in increase in cash flows. In addition to that, it will bring more control over North American operations, deliver more flexibility in the company’s strategy implementation and reduce conflicts over the product mix with bottlers. Coca-Cola usually purchases bottling operations in underperforming areas, when it believes it can improve operations. Given struggles in the European markets, I would not be surprised if the company attempts to buy those rights in a few years. Emerging markets in Asia and Latin America are key to the company’s growth strategy, as more consumers there join the middle class. For example, the average consumer in China enjoys 38 servings of Coca-Cola per year, versus approximately 400 servings for the average US consumer. The average consumer in India only enjoys 18 servings of Coca-Cola, whereas the average Russian had 69 servings of the product. In Coke’s developed markets, the company continues to invest in brands and infrastructure programs, but at a slower rate than revenue growth. Some of the competitive advantages for Coca-Cola include leading brands with high levels of consumer acceptance, a worldwide network of bottlers and distributors of Company products and sophisticated marketing capabilities. The company continues to build a supply chain network that leverages the size and scale of the Coca-Cola system to gain a competitive advantage. They work with their bottling partners to identify system requirements that enable quick achievement of scale and efficiencies. Coca-Cola tries to share best practices throughout the bottling system & address the ever changing consumer tastes. The company focuses on continuous improvement – innovations in packaging, new solutions to meet changing preferences in consumers. 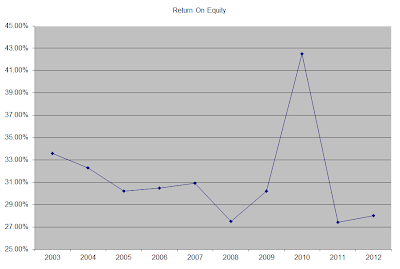 The company’s return on equity has been on the decline over the past decade, falling from a high of 33.60 % in 2003 to a low of 27.40% in 2011. Rather than focus on absolute values for this indicator, I generally want to see at least a stable return on equity over time. The annual dividend payment has increased by 9.80% per year over the past decade, which is slightly higher than to the growth in EPS. A 10% growth in distributions translates into the dividend payment doubling every seven years. If we look at historical data, going as far back as 1973 we see that Coca-Cola has managed to double its dividend almost every six and a half years on average. The dividend payout ratio has remained at or above 50% over the past decade, ignoring last year’s spike caused by the onetime accounting gain referenced above. A lower payout is always a plus, since it leaves room for consistent dividend growth minimizing the impact of short-term fluctuations in earnings. Currently Coca-Cola is close to fully valued at 19 times forward 2013 earnings, has a sustainable dividend payout and yields 2.80%. In comparison, PepsiCo (PEP) is trading at a P/E of 19.90 and yields 2.70%. For enterprising income investors, selling a January 2015 put on Coca-Cola with a strike of $40, could result in an entry P/E of about 16, if exercised. If Coca-Cola stock trades above $40 at expiration date, the investor would get to keep the whole premium of approximately $4/contract. Otherwise, just wait and look for a correction below $40. Just like practicing skills in any field, Dividend investing takes time to learn. It takes most people several years in college and grad school in order to become good teachers, lawyers, accountants etc. It is no surprise that dividend investing then takes a lifetime of practice to learn and perfect to one’s individual personality. The first trait of successful dividend investors is realizing why one wants to be a dividend investor. It requires that investors be exposed to other trading strategies, such as market timing, index investing, daytrading, swing trading, options etc. While traders in big banks like Goldman Sachs (GS) can successfully daytrade the market and earn a profit every day, this strategy might not be suitable for a person that just retired and started managing their money. By learning about market strategies, investors could develop a better understanding in formulating their trading plan. By educating themselves about how the market works, investors will develop the hunger for knowledge which would eventually bring them profits. Most important of all is to have the independent thinking to make the decision for yourself. The beauty of dividend investing is that once the perfect dividend stocks have been selected, one can basically collect the rising stream of income with little portfolio maintenance, leaving more time to other activities. The second trait of successful dividend investors is formulating a strategy which, much like a business plan, outlines how investing should be done. The strategy should be realistically tailored to the investor’s personality, in order to increase the odds of sticking to it. I mention the word realistically, because a strategy whose goal is to generate 20% yields in one year while possible, would be impractical and unrealistic. Sticking to a strategy requires discipline, which would essentially make or break the dividend growth investor’s performance. The third trait is patience. After an investor has done all the work in screening potential candidates and researching them inside and out, they have a list of stocks to purchase when they trade at attractive valuations. Since not all stocks are bargains all the time, it would take time to build a diversified portfolio of dividend producing investments. It would take a lot of patience to avoid chasing yield, not sticking to your strategy by overpaying for stocks and otherwise avoid any actions that would detract from long-term performance and achievement of investing goals. In the world of dividend investing, sometimes inaction is the best activity for most investors. In my dividend investing, I have had several examples where not doing anything has paid off. For example, I have been watching shares of Walgreen’s (WAG) for several years. I liked the business; I also like the growth prospects for the business. The problem was that the stock never really yielded much. That was until in 2010 it briefly yielded 2.50%, which is when I loaded up on the stock. Walgreen has essentially been flat over the past decade, with the dividend being a large component of total returns over the period. By having the patience to wait for the right time to initiate a position in the stock, I have avoided several years worth of watching my capital do nothing and earning no income in the process. Check my most recent analysis of the stock. I had researched each of these four companies in detail for many months and years beforehand. Once I saw the low valuations, I immediately loaded up my portfolio with quality income stocks selling at a discount. Unfortunately situations like that are seen rarely, but once they happen, investors need to be able to capitalize on them. I have spent several years writing about dividend investments, and why I consider them superior for most investors . However, I do understand that dividend investing might not work for everyone. For investors who have little or no time to focus on managing their portfolios, it is actually preferable that they put their money in index funds and fixed income. As I had mentioned in earlier articles, dividend investing could easily take approximately 10 - 15 hours/week on average. If you have a demanding career, and a growing family, your time could be better spent being invested in index funds, while learning about investments in your free time. For those who have the time, it is important to have a strategy that identified great investment opportunities, no matter whether they pay a dividend or not. It is possible that there are many outstanding businesses that do not pay dividends. For once, Berkshire Hathaway (BRK.B) is one such business. The story of Warren Buffett, who is the current CEO of Berkshire Hathaway is legendary. While he has been dubbed a “value investor”, since the early 1960s, he has been able to make hundreds of investments which are outside of the box for value investing. In essence, the Oracle of Omaha has been able to continuously learn more about business, in order to respond to the changing environment quite accurately. This has resulted in him having a strategy whose goal has been to simply uncover attractive investment opportunities, regardless of investment classification. Buffett changed course from buying undervalued securities, to buying great businesses with long lasting competitive advantages. Unfortunately, there is one Warren Buffett, but over 100 dividend champions. In addition, while Buffett does not let Berkshire pay a dividend, he routinely invests in companies that distribute their excess cash flow back to corporate headquarters for reinvestment. The investor that uncovers companies with durable competitive advantages, will likely do very well over time, especially if acquired at attractive valuations. A portion of the returns will come through capital gains, which would defer taxable liability for years. However, it would be difficult to live off such a portfolio if prices are flat or decline over time. Usually, markets might fail to appreciate a company’s growing earnings for several years, which could result in your selling great companies at low prices, simply to meet the everyday expenses of your demanding life. Of course, if you can afford to hold on to appreciating stock for years if not decades, you will likely do very well for yourself. There are companies which are great, but might not be paying a dividend for a different reason. Sticking only to a dividend strategy might cause an investor to miss such opportunities. 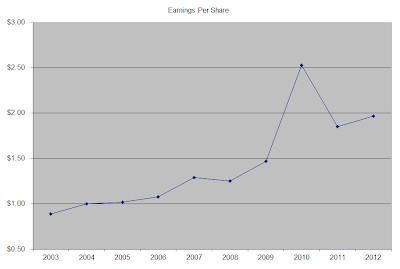 For example, Starbucks (SBUX) didn’t pay a dividend until 2008. Another company which I like is Buffalo Wild Wings (BWLD), but it doesn’t pay a dividend either. There are many growing enterprises which reinvest all money back into the business in order to grow it. As a result, many are able to grow at a rapid pace for several years. Rapid growth does not last forever however, which is why investors need to avoid overpaying for expected growth today. Investors need to understand what their investment style is as well. I have an acquaintance who worked at one of the fastest growing technology companies in the US. Being on the ground floor of this rapidly growing company, he saw that there were tremendous opportunities for years to come in the US and internationally. As a result, he has been able to deploy a large portion of his investment dollars into the company stock, and has made plenty of money. Of course, my acquaintance is at least 30 years away from retirement, which is why risky technology stocks work as his method of accumulating wealth. It is very difficult to live off a nest egg whose sole source of returns is the fickle nature of Mr Market. One reason why income investors should keep buying dividend paying stocks is because this is what they know. If you have spent your time analyzing streaks of consecutive dividend increases, projected dividend growth, and understood the underlying fundamentals behind those outcomes, you would be effectively specializing in a strategy that you can do better than the average investor. If you are able to identify businesses with strong competitive advantages, and can buy them at reasonable valuations, you can generate respectable returns over your investing career. Knowing your strategy, and having a conviction in it based upon years of experience, would make it that much easier to stick to your equities when prices go down during the next bear market. For example, I am pretty familiar with the business model of Coca-Cola (KO), which has managed to raised dividends for over 51 years in a row. It is not difficult to understand that a company that sells its branded concentrates to bottlers and other middle-men, would earns high margins on that activity. It is also not difficult to understand that a company that sells differentiated branded products, will earn a lot of money when a growing number of global consumers are exposed to it. A second reason to hold on to dividend paying stocks is because dividends provide a component of total returns that is more stable than capital gains alone. When you need to live off your portfolio in retirement, you need to generate a stream of income which is relatively predictable in a manner of timing and amount of income. This makes relying on dividend checks superior to relying on selling off stocks to meet your expenses. A diversified portfolio of dividend paying companies with strong fundamentals, and a history of raising dividends for at least a decade will be much more likely to generate a rising amount of dividends even during a recession. You have to remember that you need to eat and live even during a bear market. Flat or declining stock prices are terrible news for investors who sell off stocks in retirement in order to cover expenses. This is because they would have to sell off ever larger amounts of their portfolio just to maintain the same standard of living, if stock prices stagnate or decline. With dividend paying stocks, you get a cash return on your investment, while still maintaining the same amount of share ownership. In addition, if you have excess dividend income, you can redeploy it back into quality companies at depressed prices during the next flat or declining markets. For example, shares of Procter & Gamble (PG) have decreased by 50% at least several times over the past 50+ years. However, the company has raised dividends for 57 years in a row to its loyal shareholders. A third reason for holding dividend paying stocks is if these companies fit the investment goals and objectives in your retirement plan. The goal of my retirement plan is that my diversified portfolio generates a sufficient stream of income to cover my expenses after I stop working. Because dividend income is more stable than capital gains, it is a safer alternative that can deliver cash to pay for expenses on a timely and predictable pattern. As a result, the transition from being paid twice/month to receiving multiple dividend checks every month is easier on your personal finances. Therefore, if your monthly expenses are $1000 month, and your portfolio generates at least $1000 in monthly dividend income, you have achieved your objective. It is much easier to keep investing in income generating assets until you reach $1000/month in dividend income than worrying about accumulating a certain amount of funds first, and only then worrying about how to convert that into meeting your expenses. I find dividend investing to be a much easier approach compared to withdrawing 3% - 4% of my net worth every year. A fourth reason to keep dividend paying stocks is because they are more stable and mature than non-dividend paying ones. Only a company that generates excess cash flows that are above and beyond its needs to grow and maintain the business, will be able to pay a growing dividend to shareholders. The growing dividend is an indication of a business model that has the competitive advantages to throw off so much cash. Most companies that do not pay dividends do so because they cannot afford to pay distributions. The ones like Berkshire Hathaway (BRK.B) are the more like an exception, rather than the norm. Another reason to buy quality dividend paying stocks is because they are typically cheaper than some of the great growth stories out there. The growth stocks typically plow back every single penny back into building the organization. There is usually a lot of hype associated with many of those companies, which makes them sell at ridiculous valuations. If a company like Tesla (TSLA) sells at $150/share, this is because market participants expect it to earn several dollars/share in a few years. Given the company’s low current earnings, it seems that most of the valuation is dependent on future expectations, which can vary a great deal away from reality. If the expectations do not materialize, stock prices could be lower, and sources of return would be just from capital gains. It can work for many, but not for my style of investing. Most dividend paying stocks are usually cheaper because a regular 6 – 9% growth is seen as unexciting by market participants. This is ok, because a low entry price, coupled with modest but consistent growth can result in compounding miracles decades down the road. For example, if you can purchase shares of a dividend stock like Chevron (CVX) at nine times earnings, 9% earnings and dividend growth, and a 3% yield, you can do very well for yourself over time. Of course, if you can purchase the shares of a quality company that doesn’t pay dividends, you can also do well over time. However, your total source of returns would be capital gains. In my life, I prefer the diversified nature of both dividends and capital gains. Overall, an investor would do great for themselves if they focus their energies on purchasing quality companies at attractive valuations. The vast majority of such enterprises are dividend paying ones, although there are some exceptions. In my stock portfolio, I hold only quality dividend paying companies, because I like the consistency in the nature, timing and amount of dividend payments. Therefore, I mostly focus on the dividend contenders and dividend champions list of companies for research. As a result, despite the exceptions, I do not believe that focusing only on dividend paying stocks is limiting me in any sort of way. McDonald’s Corporation (MCD), together with its subsidiaries, franchises and operates McDonald’s restaurants primarily in the United States, Europe, the Asia Pacific, the Middle East, and Africa. This dividend champion has paid dividends since 1976 and increased distributions on its common stock for 36 years in a row. The company’s last dividend increase was in September 2012 when the Board of Directors approved a 10% increase to 77 cents/share. The company’s largest competitors include Yum Brands (YUM), Starbucks (SBUX) and Burger King (BKW). Over the past decade this dividend growth stock has delivered an annualized total return of 19.50% to its shareholders. The company has managed to an impressive increase in annual EPS growth since 2003. Earnings per share have risen by 18.30% per year. Analysts expect McDonald’s to earn $5.60 per share in 2013 and $6.11 per share in 2013. In comparison McDonald’s earned $5.36/share in 2012. The company’s international operations have fueled the strong growth in McDonald’s earnings over the past twenty years. Despite the fact that a little over half of the company’s profits are derived internationally, this segment could continue to deliver solid performance in the future. Another factor fueling the company’s growth and maintenance of its edge against competitors and other threats has been its ability to innovate in its menu and reinvent itself in order to win. Some examples of that include the addition of salads to its menu a few years ago, as well as the introductions of premium drinks for customers. Other examples include extending store hours as well as focusing on the core brands through disposition of Chipotle Mexican Grill (CMG). The company has also been able to focus on streamlining operations and focusing on same-store sales, rather than mindlessly expanding at all costs. However, it still plans on expanding store count, while also reimaging existing locations, in order to improve the customer experience. The company also has a strong brand name, which has also allowed it to pass on price hikes onto customers, who nevertheless are still perceiving it’s menu in the “value” category. As a result, inflationary pressures should not affect profitability by a wide margin. 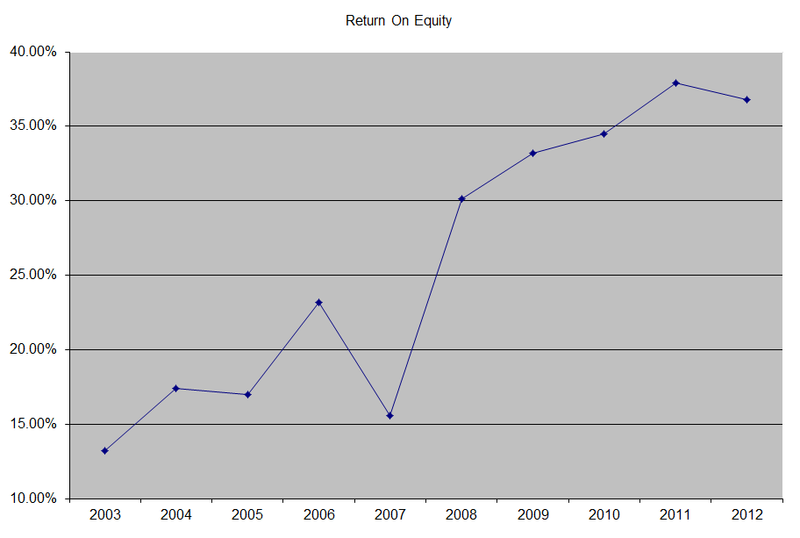 The return on equity has expanded from 13.20% in 2003 to 36.80% in 2012. Rather than focus on absolute values for this indicator, I generally want to see at least a stable return on equity over time. The annual dividend payment has increased by 28.40% per year over the past decade, which is much higher than to the growth in EPS. A 28% growth in distributions translates into the dividend payment doubling every two and a half years. If we look at historical data, going as far back as 1976 we see that McDonald’s has actually managed to double its dividend every three and a half years on average. I expect dividend growth to average 10%/year over the next decade. 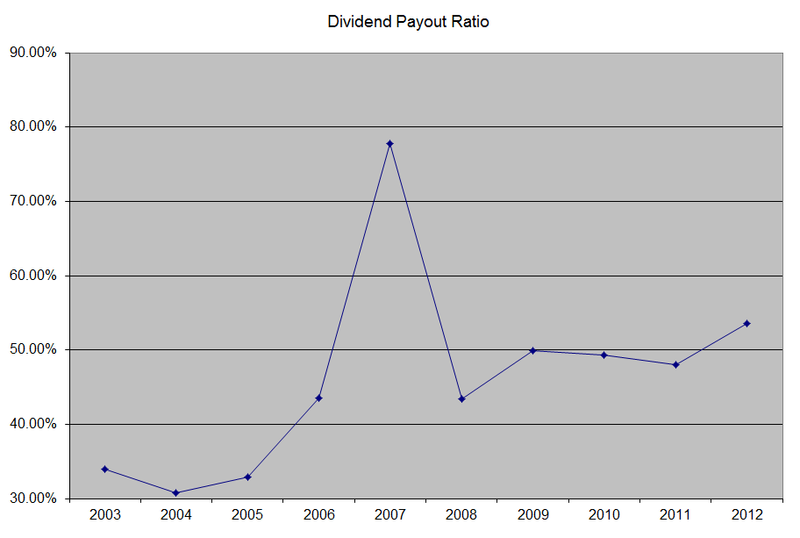 The dividend payout ratio has increased from 34% in 2002 to 53.50% in 2012. The expansion in the payout ratio has enabled dividend growth to be faster than EPS growth over the past decade. A lower payout is always a plus, since it leaves room for consistent dividend growth minimizing the impact of short-term fluctuations in earnings. Currently, McDonald’s is attractively valued at 16.80 times earnings, yields 3.10% and has an adequately covered dividend. Why do I keep talking about the same companies all the time? Dividend investing is so boring, it makes watching paint dry up look very exciting in comparison. You get to identify a few great quality companies, and then continuously try to purchase them at attractive valuations. Unfortunately, some of my readers are unhappy with the fact that I keep writing about the same stocks over and over. The point is that once I tell you how great Coca-Cola (KO) or Wal-Mart (WMT) or Exxon-Mobil (XOM) are, it seems that there isn't really much more to learn. I think these readers might have a valid point that I do tend to write about a select few companies in some of the articles discussing strategy. I can understand how this could sound boring. However, on the strategy articles I write, I use ideas like Wal-Mart (WMT), McDonald's (MCD) etc, merely as an illustration of a principle. It is true that I can use a company like Lowe's (LOW), Automatic Data Processing (ADP) or Brown-Forman (BF/B), but then some readers would be unhappy because these stocks are really expensive today. The problem is that there are only so many dividend stocks that are both 1) cheap to buy from a valuation perspective and 2) something I would consider quality companies. My starting point is usually the list of dividend champions and dividend contenders, that Dave Fish so graciously updates every month. For example, out of thousands of stocks traded on NYSE, Nasdaq and AMEX, only 105 have managed to boost dividends for over 25 years in a row. While I do focus on companies with long histories of consecutive dividend increases, I do not find all of them investable from my point of view. Every dividend growth investor has their own nuance to the strategy of course, but as a rule I tend to avoid companies I do not understand very well. For example, I am not very good at predicting whether Microsoft (MSFT) or Intel (INTC) have the same durable competitive advantages like Coca-Cola for example. I cannot foresee how disruptive changes in technology could result in changes in the way users consume computing resources. However, I can reasonably expect that people would still use the refreshment of one of the 500 drink brands that Coca-Cola sells worldwide. If you understand Microsoft or Intel better than I do however, then this is your edge and you should be sticking to it. I believe readers like to both hear about quality companies, but also want to hear about them when I think they are priced attractively. If I think Wal-Mart (WMT) is cheap today, I would keep writing about it. If Procter & Gamble (PG) is fully valued, I might not write about it. With the current bull market, oil (Chevron (CVX) and, ConocoPhillips (COP)) and some retailers ( Wal-Mart (WMT), and Target (TGT)) are the ones I have been eyeing on. This is why I keep writing about them over and over. The thing to consider is that different quality dividend stocks are available for sale at different times. For a period of 2008 – 2012, the companies like Johnson & Johnson, Procter & Gamble, Kimberly-Clark (KMB) and Colgate-Palmolive (CL) were attractively valued. This is why I kept using them as examples to illustrate my points in in my articles on dividend investing. Once they stopped being attractively valued per my understanding, I stopped writing about them, except as an opportunity to vent about their overvaluations. On the other hand, I do post a weekly stock analysis almost every Friday, where I do try to feature a different company. I have found however that the majority of readers are mostly interested in hearing about the Johnson & Johnson and Coca-Cola of the world. Unfortunately, very few readers are interested in little known companies such as Dr. Pepper Snapple Group (DPS), Casey's General Stores (CASY) or Ameriprise Financial (AMP) for example. At the end of the day, dividend investors should focus on the types of companies they understand, and then keep buying them when they are attractively valued. Dividend investing is a slow and steady process, as it takes years of meticulous monthly contributions, before you build a decent income base that allows you to retire. If you specialize in the right types of quality companies, you understand how they make money and you expect them to keep churning higher profits and dividends, then I do not see a reason to keep looking elsewhere just for the sake of looking elsewhere.